Swedish extreme metal band Bloodbath release a new DVD featuring their recent live show from Bloodstock Festival 2011. The DVD has been produced with deluxe mediabook packaging and a 16 page booklet which features photography by Enda Madden. As long time fans of the band, we are very pleased to be associated with this project. Formed in 1998 with a mutual fascination for the glory days of death metal, the band’s core line-up has remained mostly solid through the years since their ‘Breeding Death’ EP was unleashed back in 2000.Bloodbath features prominent members of Katatonia & Opeth, including the unmistakable Mikael Åkerfeldt on vocals. Bloodbath Over Bloodstock presents Bloodbath live & in-the-flesh & was filmed in August 2010 at the famed Bloodstock festival – one of the UK’s leading metal events. This DVD offers a pummelling set of ferocious brutality featuring numerous classics & fan favourites from the band’s whole catalogue of releases in an unrelenting death metal attack, including songs from 2008’s highly-acclaimed tornado of blasphemy, The Fathomless Mastery. Bloodbath Over Bloodstock comes with a wealth of extras, featuring bonus footage taken from PartySan festival in 2008, as well as extensive band member interviews. 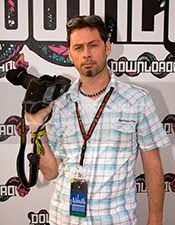 Copyright © 2009 Diary Of A Rock Photographer. All rights reserved.